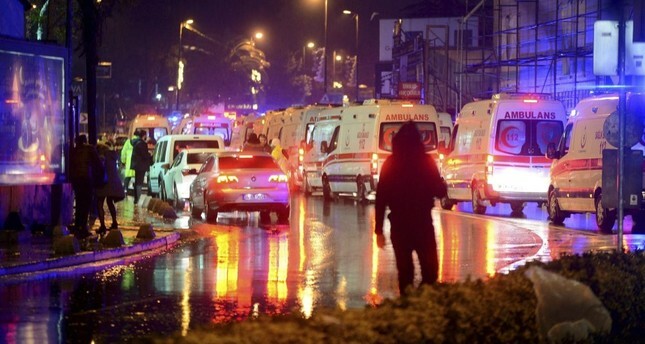 Ambulances transport the wounded after a gun attack on Reina, a popular night club in Istanbul near by the Bosporus, early morning Jan. 1. Ibrahimjon Asparov, an alleged accomplice to Abdulgadir Masharipov, the main suspect in the Reina nightclub attack on New Year's Eve, was taken into custody Wednesday in Denmark. Asparov, 42, is accused of supplying weapons and ammunition to Masharipov. He was taken into custody for a second time on a request from Ankara, according to the Danish Vejle Amst Avis newspaper. He made a court appearance in which he gave brief answers to questions from the judge, the newspaper said. After reading the summary of charges against Asparov by Turkey, Prosecutor Dorthe Moller-Andersen requested he be held for four weeks until a decision is made on his extradition. The judge accepted the prosecutor's request, which Asparov's lawyer appealed. According to the newspaper, the police also confiscated some computer equipment at the suspect's house. Asparov was detained on June 29 in southeastern Jutland with the help of the Danish Security and Intelligence Service (PET) following a request from Ankara, but was released after giving a statement. Moller-Andersen told Danish public broadcaster DR that Turkey has to request an extradition for Asparov within 18 days. If the state prosecutor responds positively to the request, the suspect has the right to go to court, she said, adding that the extradition decision would be first seen in the city court and then likely in the Supreme Court. At least 39 people, including a police officer, were killed when a gunman opened fire on partygoers at the nightclub in Istanbul's Ortaköy district. On Jan. 16, Masharipov was captured by police in Istanbul's Esenyurt district. Four other suspects, including a man of Kyrgyz origin and three women, were detained. Ankara has repeatedly voiced concern about European states' release of suspected terrorists. Turkish authorities reported some of the Daesh terrorists who carried out attacks in European cities as suspects to their European counterparts, but due to lack of taking concrete measures, they were not detained or were released. According to official sources, both the Uzbek national suspect, Rakhmat Akilov, responsible for the Stockholm attack, and the St. Petersburg metro attacker, Akbarzhon Dzhalilov, were initially deported from Turkey on alleged affiliations to Daesh as foreign fighters. Turkish security officials said that Dzhalilov was deported from Turkey in 2016 for violating the country's visa laws. Similarly, Ibrahim el-Bakraoui, 29, one of the two brothers identified by Belgian authorities as responsible for the attack that killed more than 30 people and wounded over 270 in Brussels in March of last year, entered Turkey on June 11, 2015, and was detained by Turkish authorities on June 14. He was subsequently deported on July 14, 2015, a senior security source previously told Daily Sabah. Brahim Abdeslam, one of the suicide bombers in Paris in November, was also sent back to Belgium from Turkey in early 2015. After being sent to France by Belgium, he was questioned by French authorities and was later released. According to recent official numbers, Turkey has deported over 5,000 suspected Daesh terrorist, and prohibited entry to the country to over 53,000 suspected terrorists.